Reprinted by permission of the author: Peter Bass, Broker with North Point Yacht Sales. After an offer has been accepted, the all-important survey and sea trial takes place. The surveyor works for the buyer and is responsible only to the buyer. Brokers know the surveyors in their areas and can reach out to other brokers outside their home area for recommendations, but it is imperative that the buyer do his or her own due diligence in checking credentials, and talking with the surveyor prior to the survey. For the purposes of this discussion, we are assuming that the boat has been advertised and sold with the understanding that it is in good operating condition, and that all equipment on the listing is functioning properly. Part of the survey is done with the boat hauled to check the bottom and running gear; this so called “short haul” is done at the buyer’s expense. I recommend to sellers that they make sure that the bottom is clean and zincs are fresh. Nothing shouts good care louder than a boat coming out for the short haul with a fresh bottom, clean running gear, and cutless bearings in good shape. I like to make sure that the buyers and sellers understand who is paying for the power wash if needed, and zinc replacement. 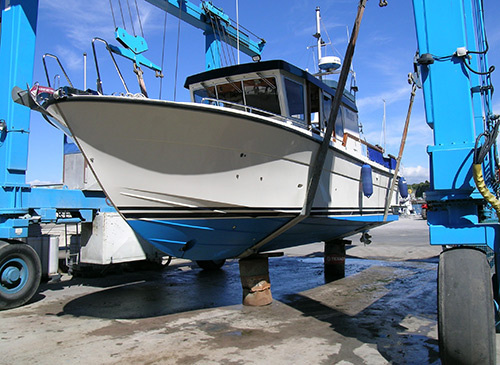 I personally believe that the the seller has a responsibility to present a boat that is ready for a sea trial and survey, which means a clean bottom, and cutless bearings and zincs with plenty of life left. If you are the seller, prior to the survey make sure everything on the listing functions properly and is available for inspection. 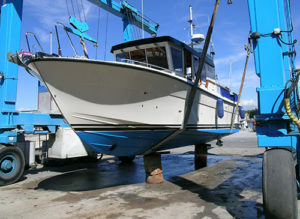 Get the bottom cleaned and advise the boatyard doing the short haul that you will pay for new zincs. If you are a good boat-keeper, you will have a spare set aboard. Take the boat out and run it long enough to check that the engines are running and cooling properly, and that full rpm can be achieved. Run the sails up and down or in and out. In other words: Put yourself in the buyer’s shoes. Post survey negotiations can be tricky: sellers often feel that they have given up more than they planned to in the negotiated price, and buyers rightly expect that everything is going to work and work properly. This is the “golden rule” moment. If you are the buyer and you hope to enjoy the good will of the seller in helping to transition and learn your new boat, don’t put the squeeze on for inconsequential issues. If you are the seller, recognize that you have a responsibility to deliver the boat as advertised, and correct anything that deals with the safe operation and function of the boat and its equipment. Remember that we are all working toward the same goal: the transfer of a complex machine that provides fun and adventure, at a fair price, and in an orderly fashion. Peter Bass joined North Point Yacht Sales in 2013, after stints in the boatbuilding, yacht brokerage, footwear, and furniture industries. He served as the Production Manager at Hinckley in the mid-1970’s, and has extensive experience in coastal and offshore sailing and powerboating, in his own boats and as professional crew on others. Since 1998 he has been a regular contributor to boating magazines; writing boat reviews, boat builder, and designer profiles. He has a particular interest and experience in Downeast style cruising and express powerboats, and ocean capable sailing yachts.